Typing your search term into Google reveals how much competition there is for a phrase in the top right corner. The higher the number the harder it will be to rank for but don’t get worried about ranking for phrases less competitive that around 2 million. Take this competition figure and use it with the other numbers you have to decide if it’s easier to be ranked for a search term that gets less searches but also has less competition. When doing your keyword research it’s worth finding out what Google thinks people are searching for when they enter that keyword term. For example if you are optimising for the term poker then simply type that term into Google and scroll to the bottom of the page. Google clearly links the search term poker the “+ terms” of free online, tips, stars, for fun, chips, learn, download and pkr. So now you have 8 new terms to optimise a landing page for which could be generating significant traffic from your main term if people click through on these links (and people love to click rather than type). Obviously getting to the top of the search results for poker rooms such as PokerStars and PKR may not be part of the plan, but again these are just examples. You might as well have the traffic over some other site and it’s all about the longtail. Always keep a list of the keywords as you sort them because once the first set of content is up you will want to produce a second page on similar keywords. You want to create this second UNIQUE page about the same subject and then place links between them both. The second half of the Google tools we’ll be using is called Google Insights for Search. This tool shows valuable comparisons between keywords and will help narrow down which term out of a selection that would be best to use. So from the earlier list of words put together I now have several words that are comparable search terms for which I’m only going to (initially) have one page on, so I have to decide which term is the best to begin with. Writing a page on how to become a poker affiliate may give me these 5 terms to write about. I’m now going to put these words into the tool and use the figures it gives me. Next put the terms into the search box (add more by clicking the add search term link). The drop down menus on the right allow searches to be refined by territory or date and can be further specified by category. Hit the search button and Google will return a bunch of data. In this instance poker affiliate is the runaway most popular term. 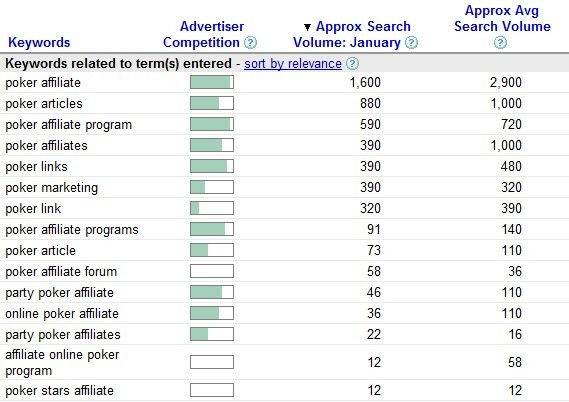 The phrase poker affiliate actually forms parts of the other searches so it’s not surprising that it’s the most popular. The numbers given here are relative figures and you have to be signed into Google to see them. Having gone through this now I realise that this isn’t the best example I could have gone with, but there’ll often be times when the figures you manage to pull out aren’t perfect. The next section graphs interest over time so you can see if a search term is increasing or decreasing in popularity as well as get an idea of any seasonality in the term. The flags on the graph relate to the other half of this section which shows news results. This helps you when trying to make sense of spikes or troughs. Whilst there’s no flag next to the big spike mid-2006 (as well as smaller spikes for the other terms) it’s probably a safe assumption that it was to do with the WSOP. Whether this was a specific poker affiliate offer or something to with Joe Hachem’s win the year before or Jamie Gold’s win that year is unclear but were it important this graph means you can investigate further. The next section the results show are the popular locations for these searches, both as text and as a map. Again the numbers given are relative. You can select the map by keyword entered. The last part again helps refine search results as it gives more related search terms from the terms that were originally entered. If a terms shows up for severl of the keyword terms then it’s always possible to add or remove terms from the top and compare again. The final part helps you get the jump on competition slightly as it shows searches that are increasing in popularity, often competitors won’t be targeting those terms yet so you can create content to capture those searches quickly. From this I now know that my page about how to make money as a poker affiliate will focus just on the term poker affiliate. Okay, no shock there, but it’s a process. I’ll be going into more depth with this tool again later but for further reading check out the options on the page from Google about sorting into categories, seasonality and geographic distribution. Google has a variety of tools that you can use for free to try and determine keywords. Building on the earlier brainstorming session we can see which words are most searched for. First up is the Google Adwords Keyword tool. This keyword tool was designed to help Adwords Advertisers find more keywords on which to bid. We’re going to use it to determine what terms people are making money on by seeing which popular terms people are bidding on. If people are bidding on them it is reasonable to assume they’re making money from them. The tool itself draws upon the number of ads it displays for each search term that is typed into Google to give you an approximation of how many times a word is searched for in a month. Remember of course that one of the limitations is that it can only draw on Google searches, depending how popular Google is in your territory will depend on exactly how useful this is. Also remember the terms that people target for PPC may not be the same ones they’re targeting for natural search. We’re going to use the tool to find words that we didn’t come up with during the brainstorming and start to eliminate phrases that aren’t popular search terms, to cut down on time spent creating content for our new site. Depending on whether we want to geo-target content on the site we can tailor the locations we want to check on in the options. Next we want to use the option to find new “Descriptive words or phrases” (this is selected by default). Then we want to add our selection of keywords which were brainstormed earlier. In this instance I’m just going to add 5 (poker marketing, poker seo, poker affiliate, poker articles and poker links). Next fill in the captcha and hit the ‘Get Keywords Ideas’ button. *TOP TIP* – Keep keyword phrases short or the tool will have difficulty selecting the important words to match. This will then return a selection of what it thinks are related words directly underneath and then a second set of more broadly related keywords underneath those. You can then sort the results by each of the columns or export the data to use in a spreadsheet program. *TOP TIP* – Export all keywords and use a spreadsheet program to sort the data. It’s much easier and more effective than the tool filters. Initially you can sort the results by approximate search volume to get an idea of what people are searching for and get a rough idea of what words you want to use. I can’t tell for every individual case what will be a good and bad keyword to go for but generally low searches with high competition are to be avoided and high searches with low competition are to be pursued. It will also fall to your own judgement what words are or aren’t relevant to what you want to write about. In this case all of my keywords look poor and many of the more broadly related keywords suggested aren’t actually what I want to be writing about. As with Wordtracker though it’s important not to use these tools as the only defining factor for choosing to go ahead or not. There are a few other, more advanced, applications of this tool that I’ll look at in future posts including how to get an idea of your competitors keywords, how to use the hidden columns and how to narrow down inflated search counts by using the ‘exact match’ feature. After exporting all the data I now have over 150 keywords from the original 5 I entered. Repeating the process for all 30 is likely to give me almost 750 keywords, many of which will be similar phrases for the same topic. Using another Google tool, we’re next going to narrow it down which one we’ll use in each instance. Before rushing headlong into buying a domain and throwing up content on everything we know about the subject we have to first think about what kind of people are going to be reading the page (readers, shoppers, etc) and what they will be looking for (if you’re creating a site that interests you then chances are it will interest others). After identifying that we need to find out how these people will find you site and whilst that comes down to many aspects it all hinges on one thing… keywords. Keywords – How to identify them and what to do with them. A keyword is a term that is used to describe what people search for to find specific information. A keyword can actually be more than just one word and is also referred to as a keyword phrase. So to find my site I expect people who are interested in online poker marketing to be able to find my site through the search engines. During the next step I’ll try to discover what else people may search for that would bring them to my site. Initially you have to have an idea for a site, in this instance I have chosen online gambling marketing. The reasoning for this is two-fold, firstly I have an interest in in it, specifically it’s my job and secondly there are not many good sites out there about this topic. If you’re looking just to make quick gains then there are several other sites on how to do that, these don’t usually last long however. If you want to create an interesting site that has the potential to make consistant money then you first need to identify what other people look for in your chosen subject. The first way is quite simply a Google search. Take what your site is about (in as few words as possible) and type it into Google. Make a note of the search results, in this instance online poker marketing returns 3.73M results (Jan 29th 2009), this could be a popular subject since it has so many competitors. However, perhaps not all are relevant. A full competition search will be explained later. Next make a note of the first result in Google, in this instance it’s the Guardian newspaper. Are the results that are shown going to be competitors for the readers you’re looking for? I don’t think that people searching for online poker marketing are going to be looking for an article on spam. The second result is for an agency and perhaps that’s what people want. Third is a bonus code, again not really what people want. Fourth’s an ezine article which is closer to what I think the results should return. And fifth is Bill Rini with an story about a failed poker viral. Whilst this may be supposition I have already stated that if the site is about something I see a need for then chances are other people are looking for the same thing. On occasion it’s best just to go for what will bring you the most satisfaction, but my first thoughts are a website like mine could help people using that search term. Scrolling further down the page there are several results related to some of the things I have in mind, but none of which would be in direct competition with my site. This is good! Assuming my keywords are popular I would be able to get a lot of traffic just by having a good site. Now that I have a general feel for whether or not to use online poker marketing as a focus the next step is to find out related words and what people search for the most. The best way of doing this is brainstorming. Simply think of all the things you might search for when looking for your site. I would recommend coming up with as many keywords as possible during this initial session, at least 30, and remember to write them all down! If you can only come up with a few don’t worry too much as the tools we will be using will also give us suggestions, once you’ve used them the first time brainstorming new sites becomes much easier. *TOP TIP* – Remember when brainstorming that plurals are different words. Affiliate and Affiliates are different terms entirely. *TOP TIP* – Remember that keywords and keyword phrases are the same thing, your brainstorming session can include single words and words that fit together such as Affiliate or Affiliate Marketing. At this stage do not brainstorm for keywords of more than 4 words. After making a note of all these the next step is to see how many people search for these terms and if we can learn a few more that are better. There are several useful tools when it comes to this, some of which I’ll mention here. From these words you can see that my site is intended to be focused on poker, casino and bingo as the main gambling terms. Sports betting and scratch cards are taking a back seat, but in theory all the ideas expressed here should work for any site or keyword. A good tool during these initial brainstorming sessions is Good Keywords. The best thing about this too is that it’s FREE! For the moment we want to use it to help come up with keywords. This is done by simply clicking on the ‘Keyword Suggestion’ button and then typing in our initial keyword. We then select the engine we want it to come up with suggestions for and click ‘go’. It will produce a list of words that can be later refined with our other tools and we may refer back to Good Keyword’s other functions later. Now that we have a list of words from brainstorming we are going to refine our keywords to find the most popular, or a niche, and initially focus on those. You will discover, with practise, that you can quickly run through many or all of these steps and obtain many good quality keywords. The order suggested here does not have to be stuck to religiously.